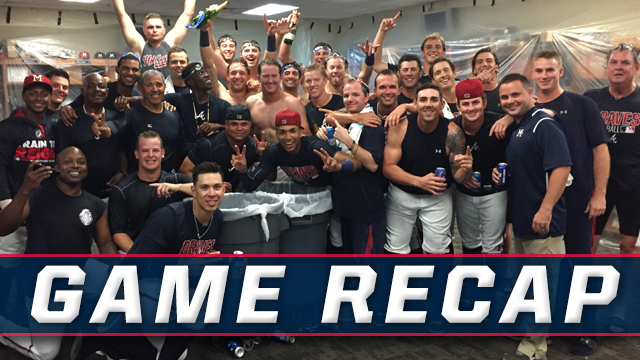 PEARL, MS -- The Mississippi Braves defeated the Pensacola Blue Wahoos 4-2 Saturday night at Trustmark Park to take the Southern League South Divisional Series three-games-to-one and advance to the Southern League Championship Series for the first time since 2008. The Braves will take a day off Sunday and travel to Jackson, Tenn., for games one and two of the SL Championship Series Monday and Tuesday at 6:05 PM CST. The two teams will take another off day Wednesday before returning to Trustmark Park for games three, four (if necessary) and five (if necessary) Thursday through Saturday. The M-Braves jumped out to a 2-0 lead in the first. Levi Hyams and Dustin Peterson reached on back-to-back singled and Joey Meneses walked. Connor Lien then delivered a two-run single to right to put the Braves out front early. In the third, Peterson reached on an errant throw by the second baseman with two outs. Carlos Franco then ripped a double to right field, driving home Peterson and extending the M-Braves lead to 3-0. Pensacola responded in the fourth. Alex Blandino walked and Phillip Ervin doubled to start the inning. Sebastian Elizalde then drove home both runners with a base hit up the middle, making it a one-run game. Johan Camargo and Kade Scivicque reached on back-to-back one-out singles to start the Braves half of the fourth. Both runners moved up on Lucas Sims' sacrifice. Mallex Smith then singled home Camargo to extend the Braves lead to 4-2. Storms rolled through after the fifth inning and delayed the game for one hour and 12 minutes. Play resumed and the M-Braves bullpen shut down the Wahoos to secure advancement into the championship round of playoffs. Lucas Sims (1-0) held Pensacola to two earned runs on two hits and two walks. He struck out six batters in five innings pitched to pick up the win. Relievers Evans Phillips, Caleb Dirks and AJ Minter (S, 1) tossed the final four innings to close out the game. Tyler Mahle (0-1) started and worked just 3.2 frames for the Blue Wahoos. He gave up four runs, three earned, on seven hits and a walk while striking out one.